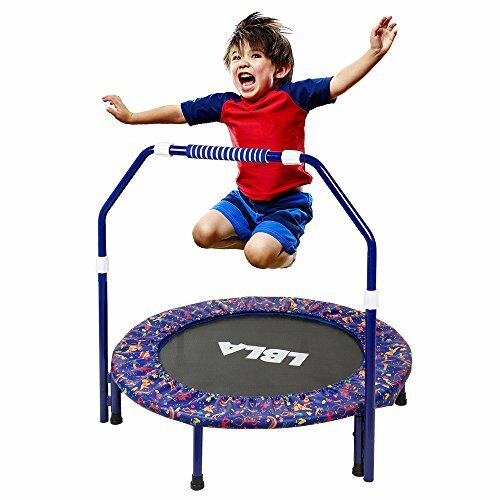 The 36in LBLA kids trampoline, with firm fabric, sturdy structure, safety-oriented handrial and protective cover, is a great way for kids to have fun, exercise and to develop coordination. - The trampoline kit is abundant of the jumping mat,the long handrail and safety enclosure. It's so easy to follow the user manual and put all together . - With the adjustable handrail and standing poles,the jumping area and height can be specialized . - The facial printing of enclosure is designed by unique image team. And the rebound bottom is made of flexible and breathable cloth. - The frame can be just folded up,that is very handy for travel or quick storage. - Please only allow one child to jump in the middle of the activity range at one time. If you have any questions about this product by LBLA, contact us by completing and submitting the form below. If you are looking for a specif part number, please include it with your message.